October is definitely one of the months I look forward to, simply because it is a beer guzzling month! 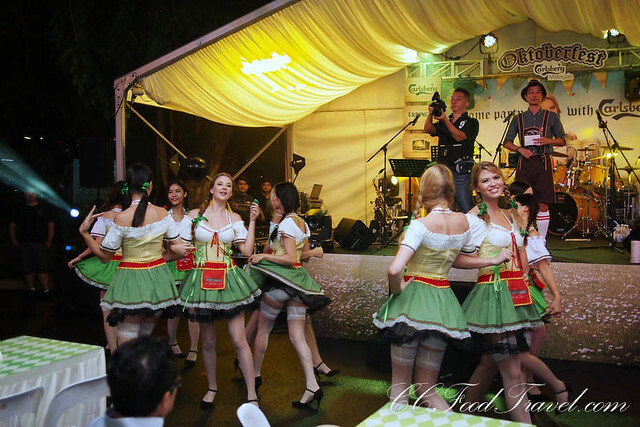 Oktoberfest was in full swing at the RP Entertainment Centre (The Saujana Hotel Kuala Lumpur) yet again this year with even more traditional German music, bratwurst and steins of beer. 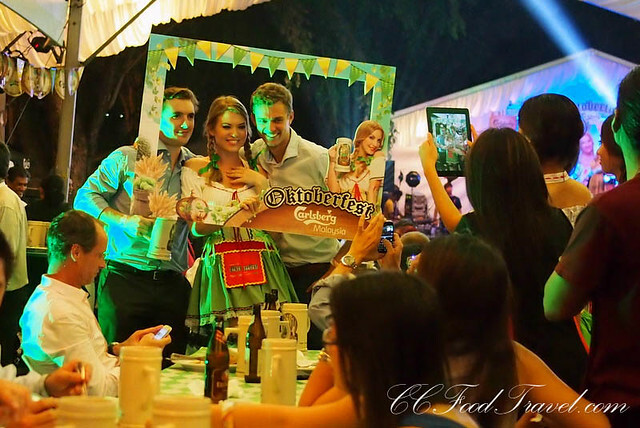 This was a rocking Carlsberg event, that saw folks getting into the Duetschland spirit complete with a fresco beer garden, a buffet of Bavarian dishes, live music, contests, games, a bier bike (no less!) and stein upon stein of Oktoberfest brews. 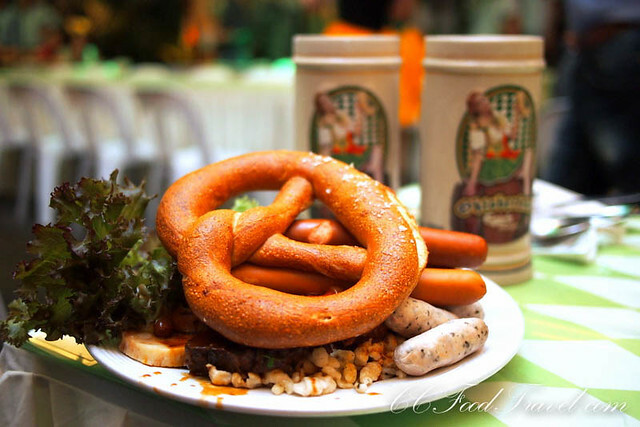 Bavarian dishes are the bomb! 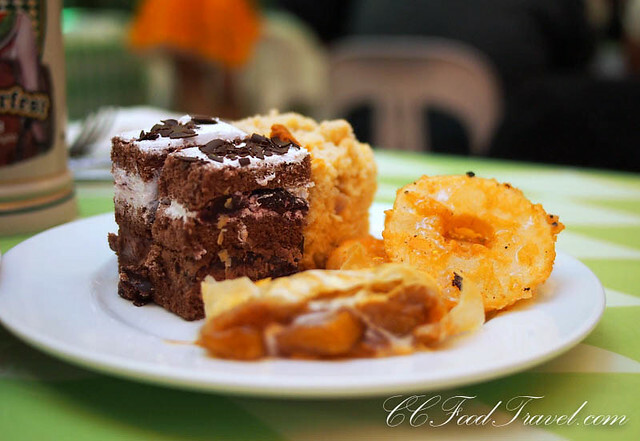 Bayrische Weisswurst with sweet mustard and Logan Brezel, Frankfurter Wurstel served with tarragon mustard and bread roll, Gegrillte Nuerenberger Bratwurst, Sauer Rinds Braten vinegar braised beef roast with Sauerkraut. 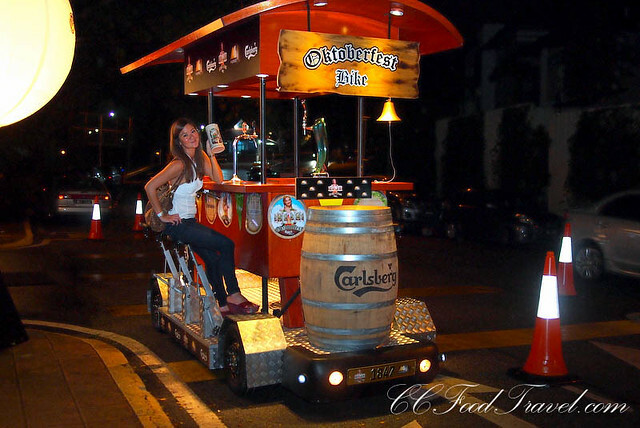 The Bier Bike – don’t drink and cycle! I couldn’t resist getting on this beer drinkers “wet-dream” which sits 6 comfortably, and all you need to do is chug! 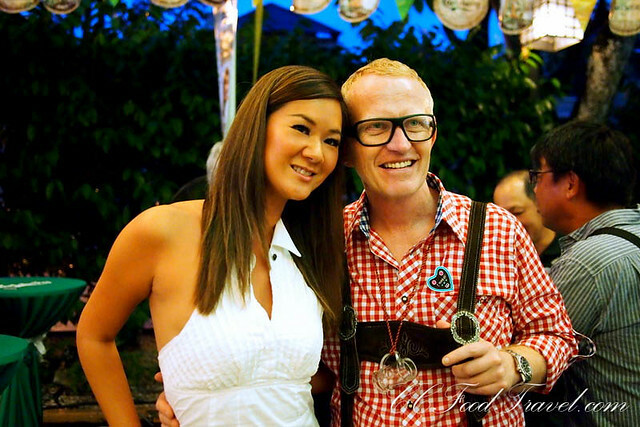 Can’t resist a photo with men in Plattlerhosen’s..
..nor pretty Bavarian lasses either! 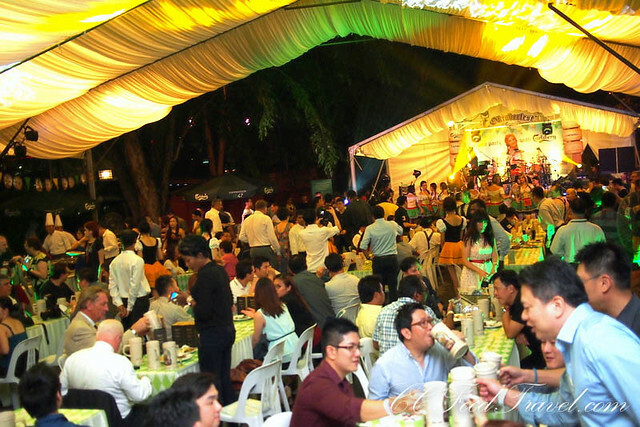 That’s right, Oktoberfest celebrations will continue at RP Entertainment Centre! From the 24th of September to the 31st of October 2014 – choices of either Erdinger Weissbier Fine Yeast 500ML (bottle) for RM 40++ or Erdinger Weissbier Dark 500ML (bottle) for RM 40++ will be the promo. 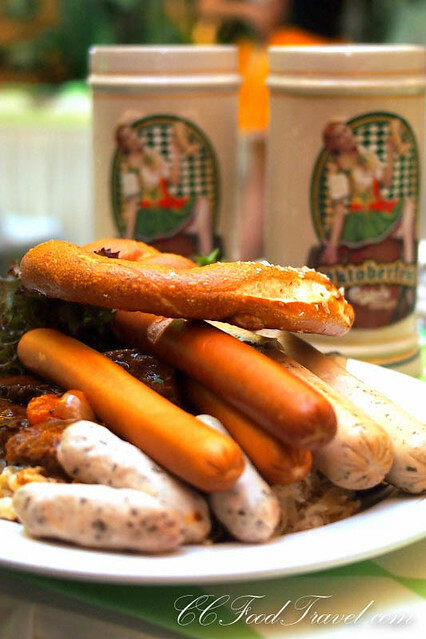 Eat Bavarian food such as foot long sausages, grilled meat loaf with bread roll mustard and onion, or cheese sausages with a rye baguette. 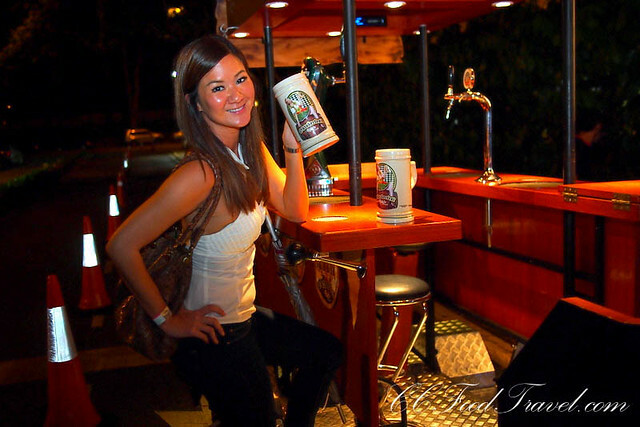 Participate in Oktoberfest themed contests / games. That night, the music was rather folk-like, with the international German band, ‘Die Emsperlen’, playing some lively tunes for the guests to chug beer to. There were guests standing, sitting, eating, dancing and taking loads of photos with the Bavarian lasses. We complimented our beverages with the Oktoberfest buffet of delicious authentic Bavarian gourmet delights and classic favourites like “Bayrische Weisswurst” boiled sausage with sweet mustard and Logan Brezel, “Frankfurter Wurstel” Frankfurter sausage served with tarragon mustard and bread roll, “Gegrillte Nuerenberger Bratwurst” grilled Nuerenberger sausage, “Sauer Rinds Braten” vinegar braised beef roast, “Sauerkraut” German style cooked cabbage, and “Apfelkiachal mit Zimtzucker” deep fried apple rings with cinnamon sugar etc. All these items are prepared by the MIGF 2014 Gold Cauldron award-winning Chef Alexander Waschl from The Restaurant, Executive Chef at The Club Saujana Resort. [email protected] CIMB cardholders are entitled to 15% to 20% off their food bill. nice shots! having fun. cheers! Those are some very large beers!! !